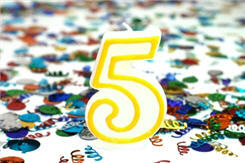 In the world of trading where 5 minutes can seem like an eternity, 5 years feels like a really long time. That’s the number I’m celebrating today, as it was 5 years ago today that I published my first post over at my original blog . I spent one year writing there before creating TheStockBandit.net. I’ve been writing here ever since, publishing some 480 posts during this stretch. I continue to be thankful for those of you who are regular readers. Your comments and emails are very rewarding, and I’m very hopeful that you return not out of habit, but rather because you find something useful here each time you visit. I’m fully aware of the many, many blogs which have popped up since I began, giving you countless choices for where to spend your time. I don’t take it lightly that you choose this site as one on which to spend some of your time. This blog continues to serve not only as an outlet for me to teach and discuss important trading matters, but also as a reminder to myself for what I need to aim for in my own trading. The growth of readership here suggests it has been helpful to you, which is certainly rewarding to see. I’m excited to see what the next 5 years will bring. I plan to continue bringing you chart reviews, trading psychology articles, market commentary, trading videos, and whatever else is suitable for the environment we find ourselves in. I hope you’ll never hesitate to comment when you have something to add.